Throughout his career, Tony “G” Gouga has been one of the most outspoken and brash players in poker history. Some of his rants against fellow pros such as Ralph Perry and Dave “Devilfish” Ullliot have earned Tony G plenty of infamy. This being said, most poker players will have few qualms about plundering Gouga’s house for $200,000 worth of iPhones, MacBooks, Amazon Kindle’s and more. Luckily, you don’t have to worry about catching a felony burglary charge while raiding Tony’s house because Party Poker are handing out the prizes. 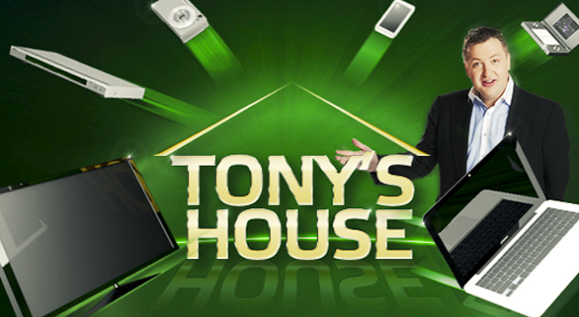 Assuming you want to get started on your way towards winning some fantastic rewards, here’s a closer look at the “Tony’s House” promotion. Earning just one Party Point will get you a Daily Giveaway ticket while earning 20 points gets you all 20 Daily Giveaway entries. Once you’re entered in a Daily Giveaway tournament, you’ll be able to win tickets for the bigger tourneys. $5,000 Daily Giveaway – Monday-Friday @ 14:30 ET, one entry for every point earned during the promo, top 250 players gain entry to Tony G’s House Weekly Giveaway, and top 50 players win a Tony G’s House Grand Final ticket. $15,000 Weekly Giveaway – Sunday @ 14:30 ET, qualify through Daily Giveaway, and the top 100 players win a Tony G’s House Grand Final ticket. $20,000 + a VW Golf GTI Grand Final – October 7th @ 14:30 ET, qualify through Daily or Weekly Giveaway. Each daily, weekly and Grand Final tournament gives away 50 prizes. Below you can see the top 10 rewards for each tournament. Party Poker offering $10k in Freerolls Every Day this January – No Requirements!